Congratulations, Class of 2016: In seven commencement ceremonies in three days at College Park Center, the Class of '16 reveled in the pomp, circumstance, and celebration that recognized its accomplishments and new adventures. See more photos. UTA asks that you Pardon Our Progress as the University begins a sustained construction period starting this summer. Construction plans include building the new Science and Engineering Innovation and Research (SEIR) building, removing some antiquated housing, constructing a new residence and dining facility on the west campus, and addressing other needed campus improvements. 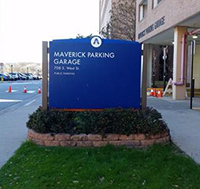 Check the Pardon Our Progress website at uta.edu/progress for the most current parking information. Thank you for your patience and understanding as the University works hard to meet the needs of employees, students, and the community. Parking rates for 2016-2017 are now posted online. The rates go into effect Monday, Aug. 1. Daily, weekly, monthly, and semester permit options for more flexibility for campus visitors. A $90 remote parking fee for students who park in Lots 25 (by the intramural fields) and 26 (by Maverick Stadium) with expanded shuttles and service routes that will get you to class or work on time. This is the third year of a three-year parking plan that involved student input and was approved by the Parking Committee in 2014. South Nedderman Drive is closed from Cooper Street to Planetarium Place for water and sewer line upgrades. Coming soon: The Science and Engineering Innovation and Research (SEIR) building will provide an iconic southern entry point for the UTA campus. 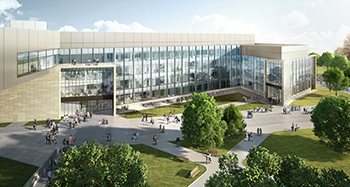 The $125 million, modern glass-and-steel building will span 220,000 square feet and add 900 teaching seats for the College of Engineering, the College of Nursing and Health Innovation, and the College of Science. See more SEIR design images. The University of Texas System Board of Regents has approved the design for a new UTA Science and Engineering Innovation and Research (SEIR) building. The $125 million, modern glass, and steel building will span 220,000 square feet and provide a new, iconic southern entry to the UTA campus, south of the existing Life Science building. The project will add 900 teaching seats in lecture halls and classrooms, which will support enrollment growth across campus, especially in the College of Engineering, the College of Nursing and Health Innovation, and the College of Science. Construction of the Texas limestone structure is expected to begin this fall with substantial completion in summer 2018. The building is designed in accordance with sustainable practices, with high energy-efficiency heating and cooling systems, water conservation practices, and sustainable materials for flooring and interior finishes. Read more about the SEIR building. Barrie Hill, communication adviser, hugs a student she has advised before the College of Liberal Arts commencement ceremony Friday. 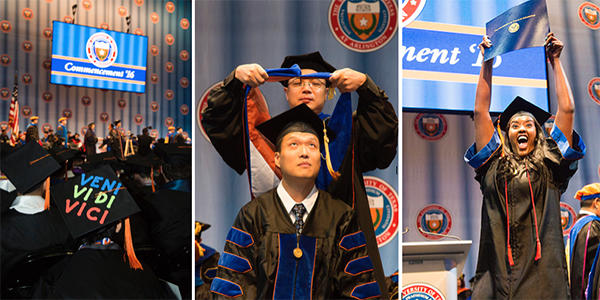 Graduates shared their stories and photos online. 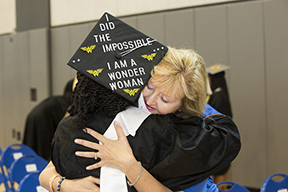 See graduate stories and photos online. Chartwell, UTA's new dining provider, began serving the campus community Saturday, May 14. Open now are the Plaza Food Court (7:30 a.m.-3 p.m. Mondays-Fridays) and Starbucks (7:30 a.m.-3:30 p.m. Mondays-Fridays). Other locations open starting June 6 include the MAC Outtakes, formerly MAC Market, (8 a.m.-3 p.m. Mondays-Thursdays) and the Connection Café (7-9 a.m., 11 a.m.-2 p.m., 5-7 p.m. Mondays-Fridays; 10:30 a.m.-2:30 p.m., 5-7 p.m. Saturdays-Sundays). 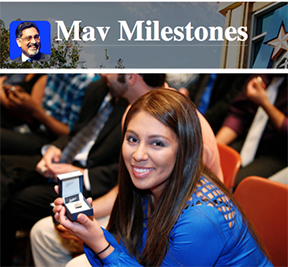 The Maverick Ring Ceremony is a happy time in a student's college experience, President Vistasp Karbhari writes. "As each student leaves at the end of the Ring Ceremony, their eyes are not on the past but looking out toward the horizon—on what comes next." Read more. In June, the Office of Information Technology (OIT) will perform maintenance to ensure continued stability and reliability of Internet, network, telephone, and IT services for the campus community. This first maintenance is midnight to 6 a.m. Saturday, June 4, and includes equipment critical to all data connectivity both on-campus and off-campus. It will affect Internet, VPN, and inside networks. The second maintenance is midnight to 4 a.m. Saturday, June 11, for equipment required for outside local and long-distance telephone service. Outside telephone service may be affected. Service disruption is not anticipated, but if it does happen, go to system status page for updates. For questions, contact the Help Desk at 817-272-2208 or helpdesk@uta.edu. UTA students, faculty, and staff can see WNBA Dallas Wings action all season with the Breakaway Pass. 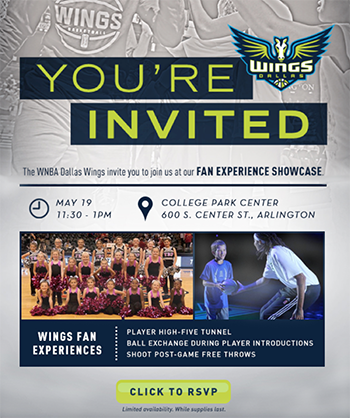 The deal gives faculty and staff members two season passes for the Dallas Wings season—17 games—for $99. Buy the Breakaway Pass at utatickets.com through Sunday, May 29. Use promo code WINGSUTA. Upcoming games at College Park Center are against the San Antonio Stars at 7:30 p.m. Saturday, May 21; the Atlanta Dream at 7:30 p.m. Friday, May 27; and the Chicago Sky at 3:30 p.m. Sunday, May 29. TrailBlazer moves to a summer schedule after this week. Keep up with campus activities throughout the summer on every other Tuesday. The next TrailBlazer is May 31. Weekly editions return Aug. 23 for the fall semester. Late registration for summer intersession and summer 14-week session. Deadline to submit transfer course work for spring 2016 graduation. To be considered for spring 2016 graduation, the deadline to have all transfer course work submitted to the Records Office's graduation desk is Wednesday, May 27. See other graduation deadlines. Contact your graduation counselor with questions. UTA men's tennis lost 4-0 to No. 11-seed Oklahoma Friday in the first round of the regional NCAA Men's Tennis Tournament in Norman, Okla. Read more. UTA softball fell 3-2 to Troy Wednesday in the first round of the Sun Belt Conference Championship in Mobile, Ala. The Mavs ended the season 29-20. Read more.